I’ve never told anyone how much I love you! You’re so handsome. You’re so substantial! And your longevity is second to none. You’re humble. You don’t put yourself forward. Many people don’t even know you exist. … you’re such a hunk, Hank! You alone fulfill all my needs. I love you, no matter what your mood. When the trials of life loom large, I know I can always count on you, Hank! You’re my one and only! Next time you’re working on a large embroidery project – especially with more specialized threads (vs. standard stranded cottons) – check with the manufacturer to see if their threads come in hanks as opposed to skeins. Hanks are substantially larger than skeins. They can save you money, time, and worry. Money: the per-yard or per-meter price of thread in a hank usually works out to quite a bit less than the same per skein. Time: you’re not likely to run out of the color as quickly, if at all – saving you shopping time and waiting time. 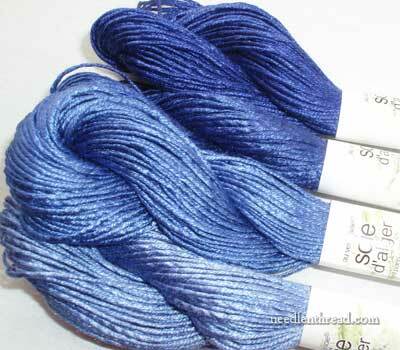 Worry: when you order a hank, all the thread in the hank comes from the same dye lot, so you don’t have to worry that there might be slight variations in shades, especially if the thread is hand-dyed. 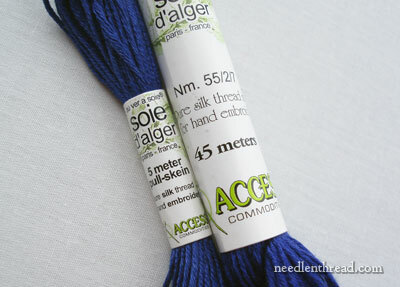 Soie d’Alger, which is the silk I’m using for the ecclesiastical project I’ve been working on, comes in 5 meter pull skeins and 45 meter hanks. 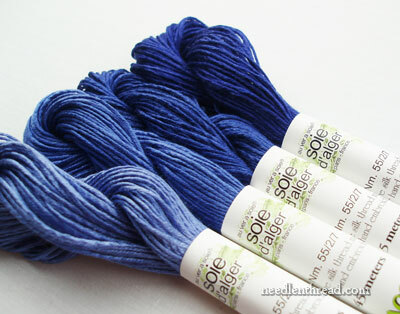 Retail, the 5-meter pull skein runs anywhere from $4.30 – $4.50. 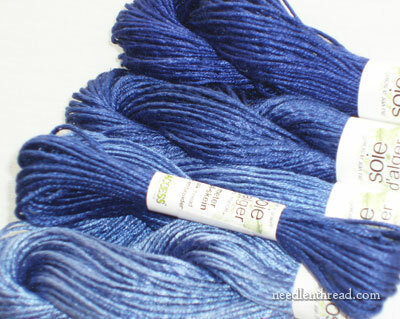 The special order hank, which has 9 times more thread to it, runs $28 – $30, which is a savings of of at least $10 for the same quantity of silk. 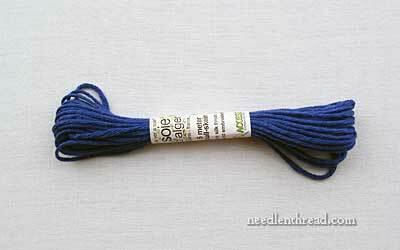 So the next time you’re working on a large project that will require a lot of the same color of thread, check with the manufacturer (or your local needlework shop owner) to see if the thread is available as a hank. You’ll probably have to special order it, but once you’ve got it, you’re set for a long time! Then you’ll understand why I love Hank so. But I don’t mind sharing him with you! Funny, funny :)Such humour, early in the morning! Sure your going to have a nice day. You’ve put a smile on my face as I near the end of my work day. So true…. always cheaper when you buy a larger quantity. I also find the thread is much smoother in the hanks. Thanks muchly for this fun and tantalizing introduction to a really neat, umm…bloke. Pleased to meet you Hank. You can probably yodel too, eh? LOL! Yeah, maybe, Kath! But never in public, of course! Whoa. Scary thought! Very funny! I can’t order from Access Comm, where I guess you’d get these hanks from. They don’t sell retail. Do you think another source would have them available to non businesses? I can do the research, I’m just being lazy! Thanks again for a great blog. Where do you order the hanks from? I don’t have a source near to me. You can order hanks of Soie d’Alger from any retail shop that sells goods from Access Commodities. In any case, you’ll have to special order them, because most shops (I don’t know of any, actually) don’t stock hanks. So, Hedgehog Handworks … Needle in a Haystack … Fireside Stitchery – any of them can special order hanks for you. Whaaa! Mary, he told me his name is Henry and he’s all mine! But then I’ve found out he’s also referred to as Silky by some soooo I guess he gets around – what a guy! But you’re right. He sounds like a hunk. Here’s hoping you’re not ‘stringing’ him along. Needlepoint Silk also comes in hanks. Some of the Wildflowers threads are also available in hanks. LOL! I was just carressing the 50g hank of DMC Coton a Broder no. 30, colour: B5200 that I ordered from Italy, it is literally still in my hands as I just opened the mail. You are not Hank’s only girl! Previous Previous post: The Nesting Place – Some Fabulous Finishes!